104 pages | 20 B/W Illus. This book provides different financial models based on options to predict underlying asset price and design the risk hedging strategies. Authors of the book have made theoretical innovation to these models to enable the models to be applicable to real market. The book also introduces risk management and hedging strategies based on different criterions. These strategies provide practical guide for real option trading. 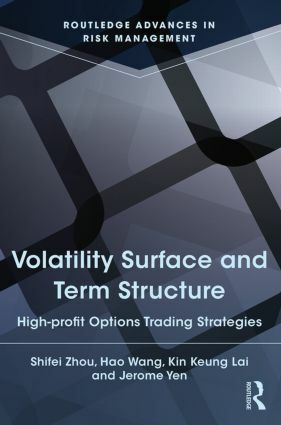 This book studies the classical stochastic volatility and deterministic volatility models. For the former, the classical Heston model is integrated with volatility term structure. The correlation of Heston model is considered to be variable. For the latter, the local volatility model is improved from experience of financial practice. The improved local volatility surface is then used for price forecasting. VaR and CVaR are employed as standard criterions for risk management. The options trading strategies are also designed combining different types of options and they have been proven to be profitable in real market. This book is a combination of theory and practice. Users will find the applications of these financial models in real market to be effective and efficient. Shifei Zhou received his master degree in Computer Science and Technology from Central South University in Changsha, China. He is currently pursuing PhD at Department of Management Sciences of City University of Hong Kong. Hong Kong. His research interests mainly focus on financial behavior, derivatives, and risk management. Hao Wang received his bachelor’s degree in Computer Science and Technology from Northwestern Poly-technical University in Xi’an, China. He is currently pursuing PhD at Department of Management Sciences of City University of Hong Kong, Hong Kong. His research interests mainly focus on risk management, financial derivatives and financial engineering. Kin Keung Lai received his PhD at Michigan State University in USA in 1977 and is currently a Chair Professor of Management Science at City University of Hong Kong. Prior to his current post, he was a Senior Operational Research Analyst at Cathay Pacific Airways and an Area Manager for Marketing Information System at Union Carbide Eastern. He is the President of the Asia-Pacific Industrial Engineering and Management Society, the general secretary of Hong Kong Operational Research Society and a council member of the International Federation of Operations Research Societies. He is also a co-editor of 8 journals including Journal of the Operational Research Society and the managing editor of book series "Lecture Notes in Decision Science". He has published five monographs and over 100 journal papers. His main research interests include supply chain and operation management, forecasting, computational intelligence and risk analysis. Jerome Yen received his PhD at University of Arizona with major Systems Engineering and Management Information Systems. He is now a Professor of Accounting and Finance department of Tung Wah College. Prior to his current post, he was a senior member of Academic Advisory Committee PRMIA, the President of Asia Pacific Association of Financial Engineering, and Co-Chair of First Asia Pacific Conference on Financial Engineering held in Hong Kong 2008. His teaching areas include Derivatives, Investment Analysis and Portfolio Management, Risk Management, Exotic Options and Structured products, and China Financial Markets. He has published over 50 journal papers. His main research interests include financial engineering, investment management, market and credit risk management, financial product development, trading strategies and hedge funds.